Retirement risk management must be dramatically overhauled if workers and retirees are to better prepare themselves to meet future retirement challenges. Recent economic events including the global financial crisis have upended expectations about what pension and endowment fund managers can do. Employers and employees have found it difficult to make pension contributions, despite drops in retirement plan funding. In many countries, government social security systems are also facing insolvency. These factors, coupled with an aging population and rising longevity, are giving rise to serious questions about the future of retirement in America and around the world. This volume explores how workers and firms can reassess the risks associated with retirement saving and dissaving to identify creative adjustments to adapt to these new risks and realities. One area explored is the key role for financial literacy and education programs. In addition, novel financial products are described that can help those acting as plan sponsors and fiduciaries reconsider pension design to better address the new realities. Experts provide new research and offer policy recommendations, illustrating how retirement plans can be amended to better meet the retirement needs of workers and firms. 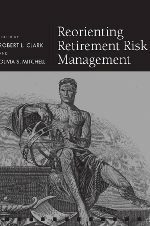 This volume is an important addition to the Pension Research Council/Oxford University Press series and to the current debate on retirement security. Chapter 4: How Does Retirement Planning Software Handle Postretirement Realities? Chapter 5: Impact of the Pension Protection Act on Financial Advice: What Works and What Remains to be Done? Lynn Pettus and R. Hall Kesmodel, Jr.
Chapter 13: Can VEBAs Alleviate Retiree Health-Care Problems?